Conor Byrne: Medieval Queens: A "Beautiful Woman" and a "Reluctant Queen"
Medieval Queens: A "Beautiful Woman" and a "Reluctant Queen"
Sisters-in-law and successive Queens of England, Elizabeth Woodville (or Wydeville) and Anne Neville are two of England's forgotten medieval queens. Eclipsed by more charismatic and intriguing consorts, such as Anne Boleyn, or foreign princesses such as Eleanor of Aquitaine or Katherine of Aragon, this seems somewhat surprising, given that both played a significant role in the civil conflict known as 'The Wars of the Roses' in the period 1464-85. Exceedingly different in their personalities, Elizabeth and Anne endured strikingly different marriages and queenships. Elizabeth was the eldest daughter of Sir Richard Woodville, who became 1st Earl Rivers, and his foreign wife, the wealthy Jacquetta of Luxembourg, dowager duchess of Bedford and, according to legend, descendant of the goddess Mesulina, likely born in 1437-8. This marriage was seen as shocking, for Jacquetta, with her superb foreign lineage and prestigious first marriage, was believed to be too great a prospect for the relatively lowly Woodville. As examples of Jacquetta's breeding, she was connected with European emperors and her relatives held important positions in Europe as bishops or counts. In view of this, her decision to align herself with a gentry family considerably disparaged her social status in the eyes of contemporaries. Nonetheless, this striking lineage is likely to have been considerably important to her daughter, Elizabeth, when she married a king some years later and was resented by other court figures for her 'lowly' position. Elizabeth's younger siblings comprised five brothers and six daughters. Undoubtedly, the size of the Woodville family attracted substantial hostility in later years when it was felt they were monopolising prestigious marriage alliances in England. Some scholars have maintained that Elizabeth, at the age of eight years old, became a maid-of-honour to the French queen Margaret of Anjou, English queen consort of King Henry VI, in 1445. Those with knowledge of medieval and early modern customs will appreciate that adolescent females were usually expected to be around thirteen years old to serve as maids of honour to queens, as the controversial later case of Anne Boleyn demonstrates. Other historians, such as Michael Hicks, suggest that this identification is mistaken. Certainly, Elizabeth spent her childhood in Northamptonshire probably acquiring social and marital skills viewed by the gentry as fundamental, including the ability to manage one's household, to sing, dance, and acquire proficiency in traditional feminine areas such as sewing and embroidery. According to contemporary sources, Elizabeth was very beautiful. One remarked that she was "the most beautiful woman in the Island of Britain", but her eyes were referred to as being "heavy-lidded like those of a dragon". If made during her queenship, this comment was perhaps disparaging of Elizabeth, viewing her as scheming, volatile or unpredictable, which may have been characteristics associated with the dragon, a mythical creature central in medieval culture. The above portrait, painted in the sixteenth century, conveys a well-dressed, confident young woman. The fact that Elizabeth was the first queen to sit for an individual portrait suggests that she regarded appearance as highly important. She was believed to have a pale complexion and superb long blonde hair. In 1456, at the age of about nineteen, Elizabeth married her first husband, Sir John Grey, who was the eldest son and heir of Edward, Lord Ferrers of Groby. According to medieval family and social customs, it seems likely that Elizabeth's parents arranged this marriage for her, which can be seen as a highly successful alliance. Daughters often married in their teenage years to achieve alliances with other prominent families in order to ensure social security and prestige. Elizabeth gave birth to two sons, Thomas, future marquess of Dorset, and Richard. Sir John, unfortunately, died in 1461 after only five years of marriage. The circumstances of Elizabeth's meeting with Edward IV, king of England following the successful deposition of the insane Henry VI, are highly controversial and have been mythologised spectacularly, as seen in Philippa Gregory's novel "The White Queen" (2009). What is clear is that following John's death Elizabeth was left in considerable financial difficulties. These difficulties meant that she was forced to turn to the king himself for assistance. However, the fact that Sir John Grey had fought on the Lancastrian side at the Second Battle of St Albans, a significant battle during the prolonged Wars of the Roses, was not likely to endear Edward IV, the Yorkist king, to his beautiful if, in his eyes, disloyal widow. After having sought the assistance of William, Lord Hastings, the king's chamberlain, Elizabeth petitioned the king. According to later stories - which must be seen as suspect - Edward IV intended to persuade Elizabeth to sleep with him, after having agreed to her suit. The new king, only in his early twenties, was amorous and jovial, enamoured of beautiful ladies. Mythologised dramatically in Gregory's novel, Elizabeth is said to have refused assertively, even drawing her dagger and threatening to stab herself if the king dared to violate her. Edward, apparently, was so impressed that he immediately proposed marriage to her. Although this account is far-fetched, to say the least, it is plausible that King Edward fell deeply in love with Elizabeth Woodville when he met her, for she was confident, enigmatic, beautiful and, perhaps most important to a new king, of fruitful stock, having borne 2 sons herself and having no less than eleven siblings. The two married on 1 May 1464 at Elizabeth's residence in Northamptonshire. This must be interpreted as a spectacular family triumph for the Woodvilles. Unfortunately, it attracted considerable hostility from other nobles, while the king's closest advisers, namely Richard, earl of Warwick, viewed the king's actions as stupid and reckless. According to medieval royal customs, kings traditionally married females from other royal houses to ensure strong alliances between countries and to improve or bolster their familial lineage. By marrying a commoner, Edward set a precedent for later queens of England, most famously for those of his grandson Henry VIII. On 26 May 1465, Elizabeth was formally crowned queen of England. According to contemporaries, there was 'universal disapproval' to the match, in the words of Michael Hicks. Polydore Vergil, a Tudor historian, asserted that it was motivated by 'blynde affection, and not be reule of reason'. Even the king's relatives, including his formidable mother the duchess of York and his brother Richard, were not enamoured of his new wife. Elizabeth gave birth to the couple's first child, Elizabeth later queen of England, in February 1466. Like her mother, Elizabeth proved to be a fruitful bride, giving birth to ten children in some nineteen years of marriage, of whom eight survived to adulthood. She was granted secure revenues as queen, although these were worth considerably less than those of previous medieval queens. Elizabeth was not a popular queen. Her family was perceived to be scheming and greedy; her eleven siblings caused substantial resentment, since because they all had to be married to other nobles, this left few other marriage alliances possible for other nobles. Katherine, the queen's younger sister, was married to the youth Henry Stafford, second Duke of Buckingham, who apparently responded by throwing a tantrum. Elizabeth's brother John, who was twenty years old, was married to the 69-year old Katherine, duchess of Norfolk, which caused major controversy and disbelief. Ironically, John predeceased his aged wife. The queen's other siblings were married to the sons of the earls of Kent, Pembroke and Essex. However, while this angered other nobles, it should surely be seen as natural for the queen to achieve successful marriage alliances at court for her relatives and friends, well established in royal precedent. The queen's personality is something of an enigma. Judging by later actions, she was brave, courageous and resourceful, but during her queenship she was perceived to be cold, ruthless, calculating, scheming, manipulative and common; like Anne Boleyn sixty-five years later, it was commonly believed that Edward had only married Elizabeth for her beauty, ignoring her lack of suitable qualities to be queen. Viewing Elizabeth with gender and sexuality in mind allows a more nuanced understanding. Her beauty and sexual fascination attracted curiosity or hostility, yet she was in some ways a suitable medieval consort, in particular due to her ability to bear many children. This was necessary, for, as has been pointed out, no consort was ever really safe until she had done that. Others associated her and her mother with witchcraft, largely because of the belief that they were related to Melusina, the goddess and/or witch of legend. Jacquetta was accused of witchcraft by one of Warwick's followers, but was shortly after acquitted. This occurred in context of Warwick's increasing dissatisfaction with the king, intensified by his hostility to his marriage with Elizabeth. Warwick resented the Woodvilles' increasing hold on power in the English court. Fearing his loss of influence, he associated himself with the king's dissatisfied younger brother, George duke of Clarence, and it is possible that the two plotted to remove Edward and establish George as king. Rumours alleged that the king's mother was also involved. Warwick rebelled in 1469, aiming to eliminate members of Elizabeth's family prominent at court. This spectacular coup saw the king fleeing into exile in October 1470, while the queen sought sanctuary at Westminster Abbey, where she gave birth to her son and heir, Edward Prince of Wales, who was later murdered as one of the Princes in the Tower. Her husband successfully returned to power in 1471, and the unfortunate Henry VI, who had briefly become king again, was murdered on the orders of the king in the Tower. Warwick had died in battle at Barnet. Elizabeth was a conventional medieval queen consort in participating in pious acts and by co-founding Queens' College, Cambridge, although some have alleged that she did this merely to attempt to wipe out the memory of its previous founder, Margaret of Anjou. 1478 saw Elizabeth's younger son, Richard, who was merely five years old, marrying Anne Mowbray. That same year saw the execution of the king's brother Clarence, an act which revolted English society and was laid at the hands of the queen. She had certainly supported Edward's other brother, Richard, against Clarence, and in the words of Hicks, Clarence's 'trial was peppered with substantial Woodville involvement'. Considering gender, however, allows one to modify this view. Although Elizabeth may have feared or resented Clarence, it was ultimately the king who ordered the judicial murder of his own brother. Medieval society always blamed the woman, identifying them as evil and instruments of the devil. Elizabeth was almost certainly portrayed as evil or murderous in order to present her as a scapegoat for her husband's actions. Elizabeth became Queen Mother following the death of her husband in 1483 at the comparatively young age of forty-one. His lust and gluttony was held responsible for his premature demise. The Woodvilles and Hastings' faction had become bitterly divided at court and, although Edward had tried to reconcile the two on his deathbed, conflict erupted following his death. The queen and her family dominated the council in the wake of the king's death and plans were on hand for the immediate coronation of the eldest royal son, Edward, aged twelve. Unfortunately, however, it seems likely that the hostility towards the queen's family intensified now, and the queen was more vulnerable without her husband's protective influence. Richard, duke of Gloucester, who had previously co-operated with both Edward and Elizabeth, appears to have panicked, fearing his loss of influence at court, although others alleged that his conspiracy to attain the throne had been devised and planned for some time. Anthony Woodville, brother to the queen, and her father John were both arrested and beheaded, a cruel act which must have angered and upset the queen. The new king, Edward V, was also seized by his uncle. Although Edward V was conveyed to London by Richard, Elizabeth was not reassured by Richard's letters, mistrusting and fearing him. Demonstrating his panic, Richard had Hastings, the king's closest friend, beheaded in the early summer. On 25 June 1483, the act 'Titulus Regius' asserted that the late king's marriage to Elizabeth Woodville had never been valid, on the grounds of his precontract to Eleanor Butler. In effect, the new king and his brother, Richard, were bastards, and their uncle, Richard, the only legitimate claimant to the throne. The queen was accused of plotting against Richard with several others, including the late king's mistress Jane Shore, and was also accused of witchcraft. She resided in sanctuary at Westminster Abbey, although she later gave up her younger son, Richard, into the hands of the by now new king Richard III. Whether Elizabeth actually gave up her younger son to Richard is fiercely contested. There have been controversial theories about the deaths of the two Princes in the Tower, relating to whether it was Richard III, Henry VII, or someone else who had them murdered, and whether both boys were the Princes, or whether one was an impostor and the real young Prince Richard protected. Undoubtedly, the legitimate king Edward V was murdered, aged twelve. By the autumn of 1483, the boys were no longer seen at the Tower, making it virtually certain they had been killed by that time. Elizabeth remained a figurehead for rebellion. She appears to have begun plotting with Lady Margaret Beaufort, a Lancastrian, and arranged for her daughter Elizabeth of York to marry Margaret's son, Henry Tudor, if he successfully became king. We know with hindsight that he did, defeating Richard at Bosworth in 1485 and marrying Elizabeth of York in 1486, who gave birth to her first son Arthur that year. However, the Queen Mother did not enjoy complete happiness during her daughter's queenship. Her dower lands were confiscated, and it was alleged that she was plotting against her new daughter, for which there is no proof. She died in 1492 and was buried beside her husband, Edward IV, at St George's Chapel, Windsor. Never a popular queen, Elizabeth lived a spectacular life. Although probably both her sons tragically were murdered, she ultimately triumphed with the accession of her daughter to the throne, having married the Lancastrian king, Henry Tudor, and founding a new Tudor dynasty. The woman who followed Elizabeth Woodville to the throne following the death of her husband Edward IV was Anne Neville, her sister-in-law. She was the daughter of Richard Neville, earl of Warwick, who had rebelled against Edward in the 1460s before dying at Barnet in 1470. Like Elizabeth, Anne was a prominent figure in the Wars of the Roses. Her life, like Elizabeth, was extraordinary. Little is known about Anne personally. Like another queen consort, Jane Seymour, who reigned fifty years later, Anne's personality is shrouded in mystery. A chronicler, knowing her personally, described her as being beautiful, virtuous and gracious. Anne was of better birth than Elizabeth Woodville, since her father was of an old and noble family prominent in the north of England. Anne spent most of her childhood at Middleham Castle, where she and her younger sister Isabella later met the Duke of York's sons, Richard (later king) and George duke of Clarence. In 1469, Isabella married Clarence and, the following year, Anne was betrothed to Richard duke of Gloucester. However, Anne was not fated to marry Richard at this time. Political unrest and dissatisfaction at court, led by Anne's father Warwick, had led to the insane king Henry VI reigning again and the deposing of Edward IV. The Treaty of Angers, conveying the international scale which the Wars of the Roses had encompassed, provided for Anne Neville to marry Edward, prince of Wales, who was the son of Henry VI and his queen, Margaret of Anjou. They were betrothed on 25 July and married in December 1470. Anne's husband, Edward, died at the battle of Tewkesbury, leading to the successful coup by Edward IV in recovering his throne. This left Anne in a precarious situation. Not only had her father Warwick been slain at Barnet in 1470, but she was now a widow at fifteen years old, and probably suspected of disloyalty by the king and his queen. Since she was a powerful heiress in her own right, she was a magnet for wealthy and ambitious courtiers seeking to improve their financial and social status. Richard, however, still desired to marry Anne. On 12 July 1472, Anne and Richard were married at Westminster Abbey, while their principal residence was Anne's childhood home, Middleham Castle. Anne gave birth to a son, Edward in 1473, who tragically died in 1484, aged eleven, meaning that Richard, who by then was king, had no male heir to succeed him. Having established the events of the coup of 1483, following his triumph as king, Richard's wife Anne became Queen of England that summer. Since she was accompanied by less than half the knights Elizabeth Woodville had enjoyed, this has been seen as evidence that the new royal couple were viewed with hostility or discontent by the English population. Of course, we do not know Anne's private thoughts either about her new status or her husband. Since she came from an ambitious family, it is possible that she enjoyed being queen, the highest social and political status a medieval woman could aspire to. However, Hicks has downplayed her importance, suggesting that she was 'an insignificant queen' because of her frequent ill health. She did not control her own inheritance or have the dowerlands assigned to other queens. The death of her son severely upset Anne, but she was unable to provide Richard with another one. Perhaps in view of this, rumours circulated that Richard meant to put aside his queen and replace her with his own niece, Elizabeth of York, daughter of Elizabeth Woodville. This problem was tragically, if speedily, resolved on 16 March 1485, when Queen Anne died at Westminster, perhaps of tuberculosis. Nonetheless, Richard's enemies alleged that he had poisoned his young queen, since she was unable to provide him with a male heir following the death of the prince a year previously. Anne was later buried in Westminster Abbey. 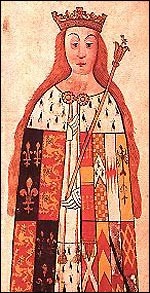 It would be fair to say that Anne Neville is one of the more neglected or insignificant queens of England in our history. Like Jane Seymour, we know nothing about her personal thoughts, motivations or feelings during her life. A typical medieval woman in that her life was controlled and shaped according to the wishes of her father and later two husbands, she reigned for only two years before her untimely demise, although it seems that she had been suffering from ill health for a conspicuous period. What is reasonable to suggest is that she was the antithesis of her predecessor, Elizabeth Woodville, a courageous and determined woman who nonetheless alienated many at the English court. Both women, however, played important roles in the Wars of the Roses, even if they saw significantly differing experiences as queen. Feminism and the Wives of Henry VIII?